Diamondback terrapin nesting on the SouthCoast of Massachusetts is edging very close to an end … almost four weeks early. Normally, second clutch nesting lingers through the first three weeks of July. 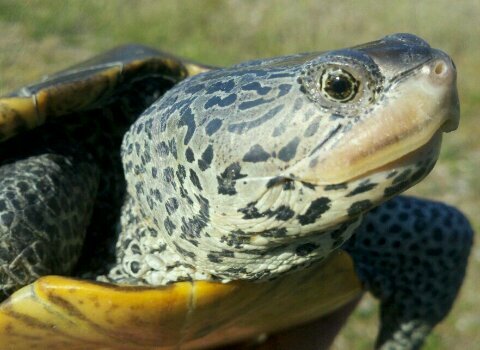 This year, an unprecedently warm spring spurred early terrapin emergence from winter slumber nearly a month ahead of schedule. 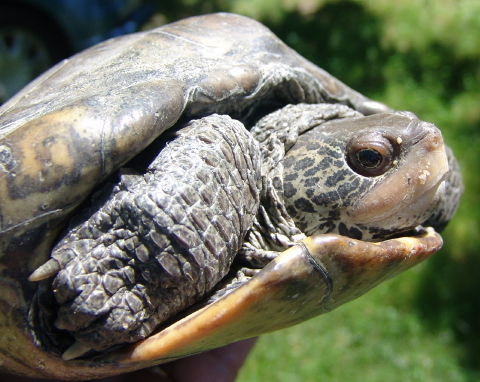 Turtle Journal’s Sue Wieber Nourse observed mating behavior in mid-April, nearly four weeks earlier than previous years. 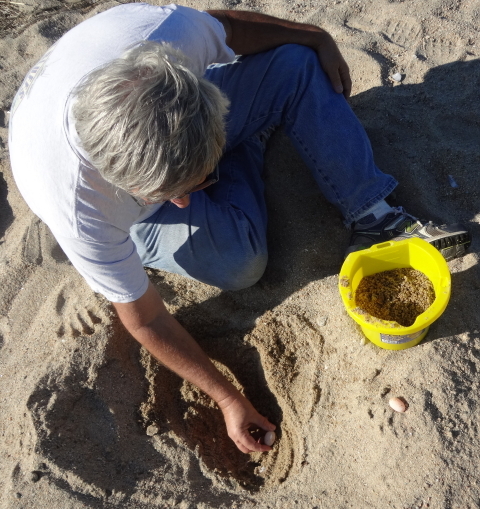 Sue documented first terrapin nesting in May when we had never recorded SouthCoast nesting in that month before. So, here at the end of June, only a few female terrapins are straggling ashore to deposit their second and final nest of the year. 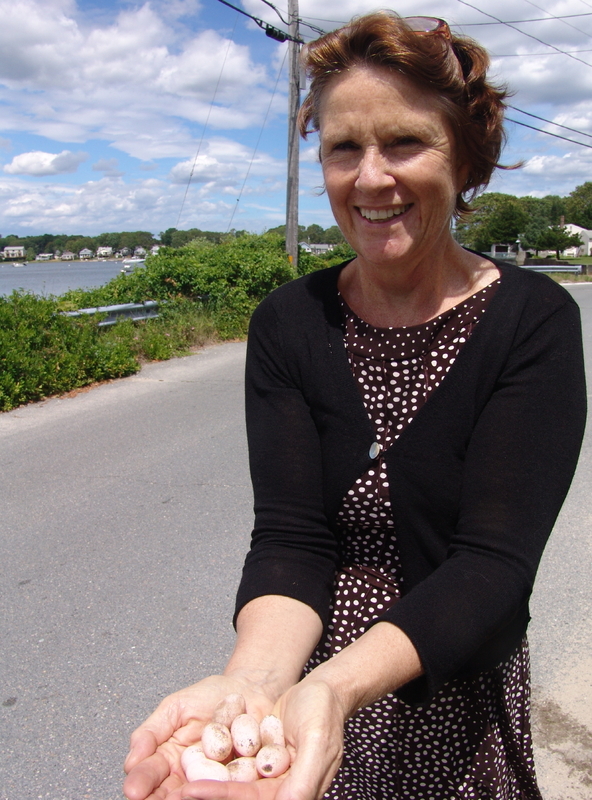 On Wednesday afternoon, June 27th, female Terrapin #824 crawled ashore along the Hamilton Beach causeway in Wareham and scratched out a nest in the shoulder of the asphalt road. Karen Spinks drove by the spot and saw the turtle working on her nest. She walked back to ensure the turtle remained safe from evening commuter traffic, while the terrapin finished depositing her eggs and meticulously covered her nest. Karen called the Turtle Journal team to inspect the turtle and to protect the eggs. We had recorded 8 depredated nests along the causeway just last week. Because of the extreme vulnerabilty of nests in this area and the impossibility of installing a predator excluder along the narrow asphalt causeway, we harvested the eggs and removed them to a safe turtle garden. When hatchlings emerge in September, Turtle Journal will return them to their natal nursery salt marsh. Rufus, the Turtle Dog, still finds an occasional nest during her morning patrols. Once she confirms the nest, she stands alert and motionless until a researcher arrives to protect the eggs. A female or two like the one above still come ashore to nest on the Aucoot Cove barrier spit. Available nesting spots are not too promising as illustrated by the gravelly substrate this female terrapin is trying to penetrate to shape her nest. With Fourth of July approaching, the busy-ness of the tourist season escalates on the SouthCoast, increasing risk to wandering terrapins. This female was run over near heavily trafficked Route 6 as the road crosses the Weweantic River at the Marion-Wareham line. She was grievously injured and brought to Turtle Journal HQ. She expelled her eggs without digging and before expiring from the trauma. 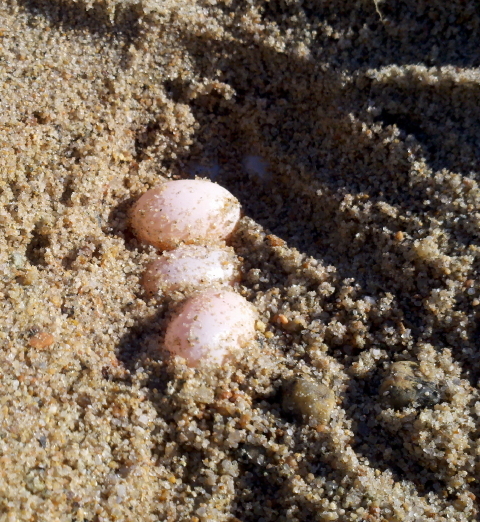 Her eggs were relocated to a protected turtle garden where they will safely incubate. Once they have hatched, these babies … preserving the mother’s DNA … will be released into a nursery salt marsh in the Weweantic estuary. Turtles of Cape Cod Field School participants strolled down to Fresh Brook Run at low tide this morning to search for diamondback terrapins. 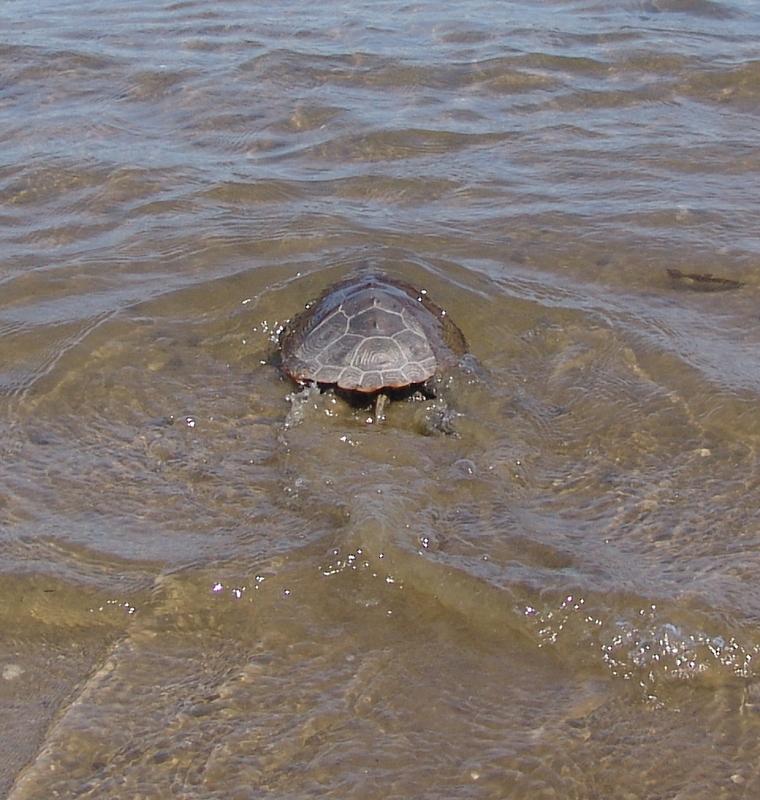 With mature females dispersed to nesting sites, we expected to find mostly males and juvenile female turtles. Our expectations were met and exceeded with the capture of 34 specimens, 23 of which were seen for the first time today. Except for two mature ladies, all other captures were males of all ages and young prepubescent females in the 4-to-6 year old range. The gorgeous young female above is a 5-year-old about three years shy of maturity. 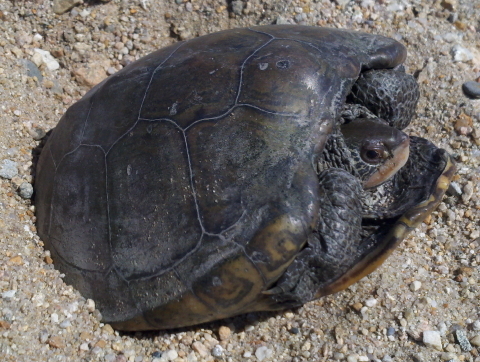 Male Terrapin #9275 is an interesting turtle that we had previously captured in the Run on 16 May 2009. He sports a very small and very dark shell. No matter how much he wriggles his body, Terrapin #9275 just doesn’t seem to fit. Turtle Field School kicks off on Thursday afternoon with discovery of female Diamondback Terrapin #130. We have been following this beautiful lady since June 1989. She nests on Mass Audubon’s Wellfleet Bay Wildlife Sanctuary’s Goose Pond Trail. She lost her right rear limb prior to 2001. So, nesting for #130 can be very challenging. She sometimes leaves eggs on her right side uncovered. Patience! 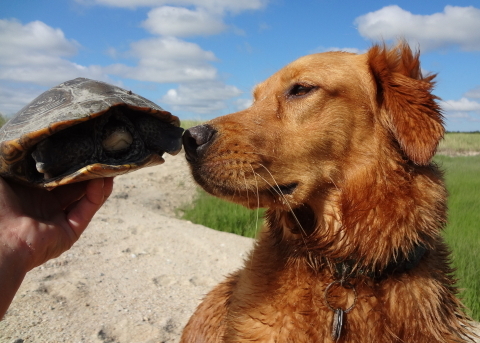 When you take on turtle research, you intuitively expect that patience will be an important virtue to master. 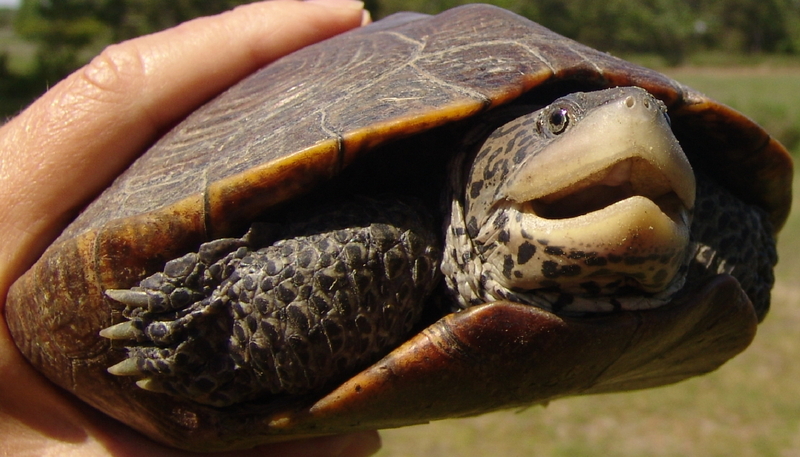 When you conduct a longitudinal study of turtles, with the emphasis on “LONG” in longitudinal, the virtue of patience becomes the cornerstone of success. So Turtle Journal has learned and relearned through the years … and decades. 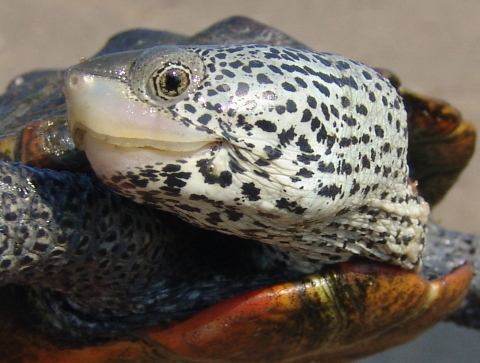 Yet, every so often comes a particular turtle and a special discovery that drive home the critical importance of observing activities and maintaining meticulous records over long periods to uncover the secret lives of diamondback terrapins. In correspondence earlier this week, we had restated our most important goal of discovering where turtles from the Sippican Harbor mating aggregation nest. We have been following females in this aggregation since 2003; yet, we have been unsuccessful so far in verifying their nesting sites by finding a marked turtle from the aggregation on a nesting beach. 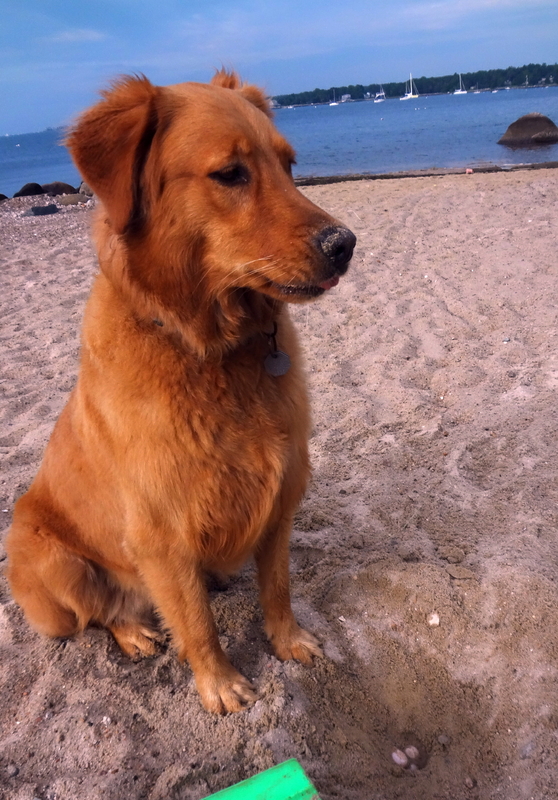 This Father’s Day morning, Don serendipitously diverted his Sunday run to inspect some scattered beaches on the west shore of Outer Sippican Harbor for signs of nesting activity. The tide was all wrong, so finding a nesting terrapin was out of the question. Except there she was! Tucked away in a quiet spot, mostly camouflaged, lay Terrapin #777 atop her nest. This lucky lady had sustained massive shell trauma early in her life. Turtle Journal had captured her in the Sippican Harbor mating aggregation on June 25th, 2005. Her carapace had sustained significant injury; marginal scutes across the entire front were missing, as well as in the rear, making her very vulnerable. We marked her “777″ largely because those scutes were still present, but also to signify her good fortune to have survived. Now, we have been equally blessed by #777, as she is the very first turtle from the Sippican mating aggregation to have been found on a nesting beach. And it only took a decade of observations during our SouthCoast longitudinal study to discover. Patience! Also serendipitously during today’s run, Don discovered nesting activity at Tenbrook Beach off Tabor Academy’s Schaefer Lab. 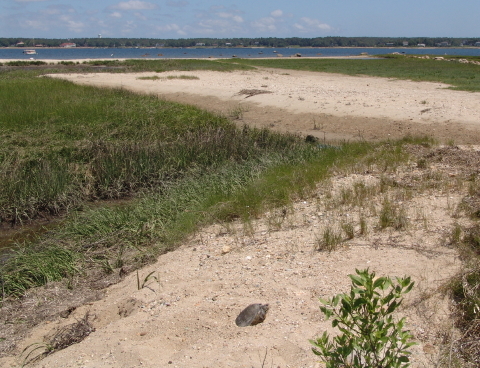 This area had been one of the first nesting sites discovered on the SouthCoast by Sue Wieber Nourse when she and her students had confirmed the presence of terrapins in this estuary back in 2003. 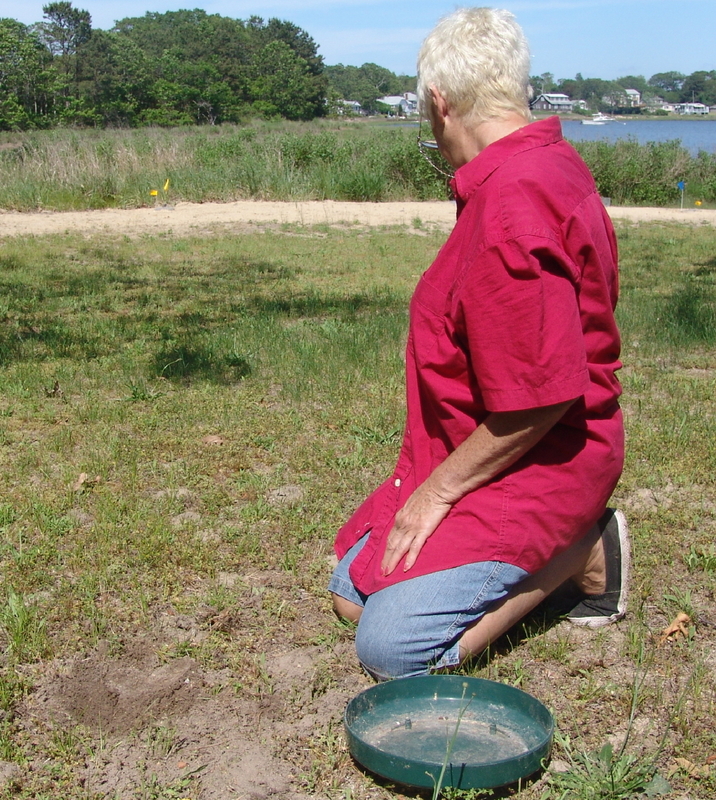 As holder of the Jaeger Chair in Marine Studies, Sue had her students document terrapin nesting at the Schaefer Lab site with the Massachusetts Natural Heritage & Endangered Species Program. 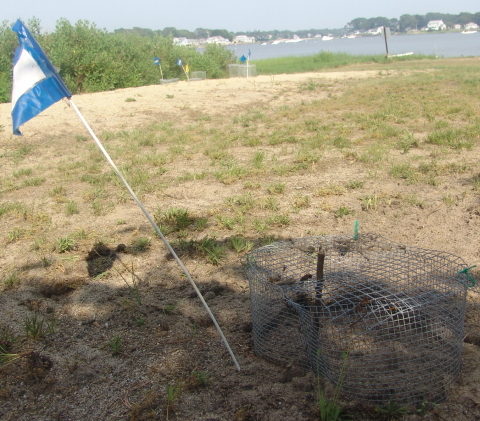 Unfortunately, after Sue left Tabor Academy, the nesting beach was converted to a kayak storage area, blocking access for these threatened critters to their natal nesting site. Reading the tracks this morning, Don noted the turtle had tried several unviable scrapes around the kayaks and then had returned to the harbor without depositing their eggs. 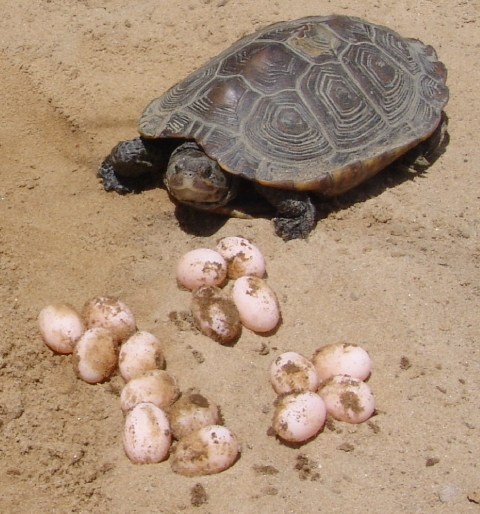 Finding nests is another turtle secret that Don oft ascribes to “divination.” Reading tracks is a fundamental skill gained through patience and practice during a decades long longitudinal study. 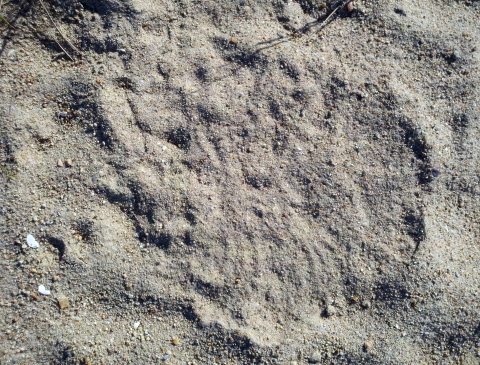 The photograph above is “as good as it gets” for identifying a terrapin nest. 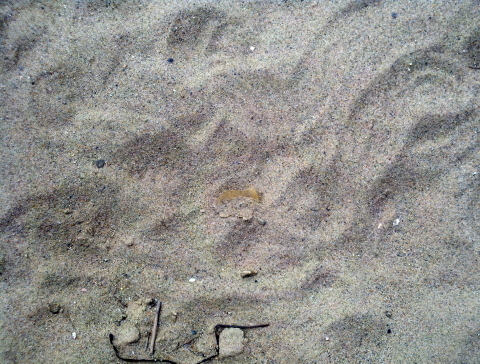 Fortunately, we had come across this section of barrier beach shortly after the turtle had concluded her nesting run. As all terrapins do, she covered it over and disguised the shaft and egg chamber. The last step for the turtle is to tap down the sand atop the nest, and then crawl away without leaving any detectable foot prints. 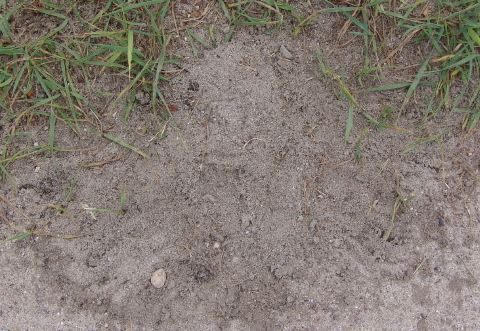 Unfortunately for turtles, as they dig and cover the nest, they blend top sand with bottom, and moisture darkens the color of the surface for a few minutes until bay breezes dry the mixture into a common, undistinguishable hue and pattern. Through patience and long pracitce, it becomes easier for a reasearcher to “read” surface markings like a legendary tracker of old. Or as Don might say, a researcher learns the dark art of divination. Brushing the topsoil with the side of his hand and then probing gently with his fingertips, Don found the “sweet spot,” the shaft that leads to the broader egg chamber. The sweet spot is called sweet because even though it has been refilled with sand, the shaft feels softer than the surrounding soil. 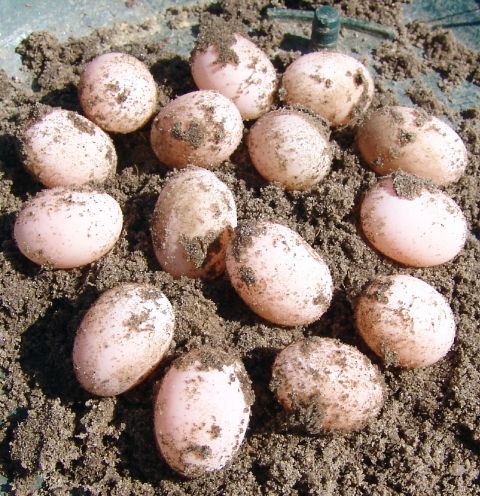 Bright pink eggs, still slightly soft to the touch, indicate an extremely fresh nest. Like excavating a delicate archeological site, Don continues to investigate with his fingertips and removes eggs from the shallow chamber to relocate them to a more viable location. This area of barrier beach is regularly patrolled by raccoons, skunks and foxes in search of protein for their young and themselves. Nests left to their own are depredated at a rate greater than 90%. This particular nest held seven extremely large eggs weighing in the range of 10 to 11 grams and measuring between 3.5 and 3.9 centimeters in length. In total they weighed 74 grams and should produce very healthy baby hatchlings in another 60 to 75 days of incubation in a safe turtle garden. 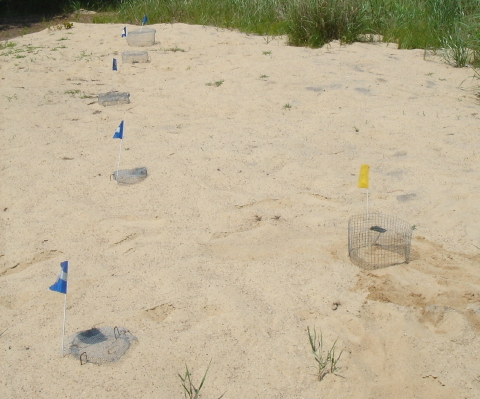 After they hatch, the babies will be brought back to their natal site for release into the abutting nursery salt marsh. 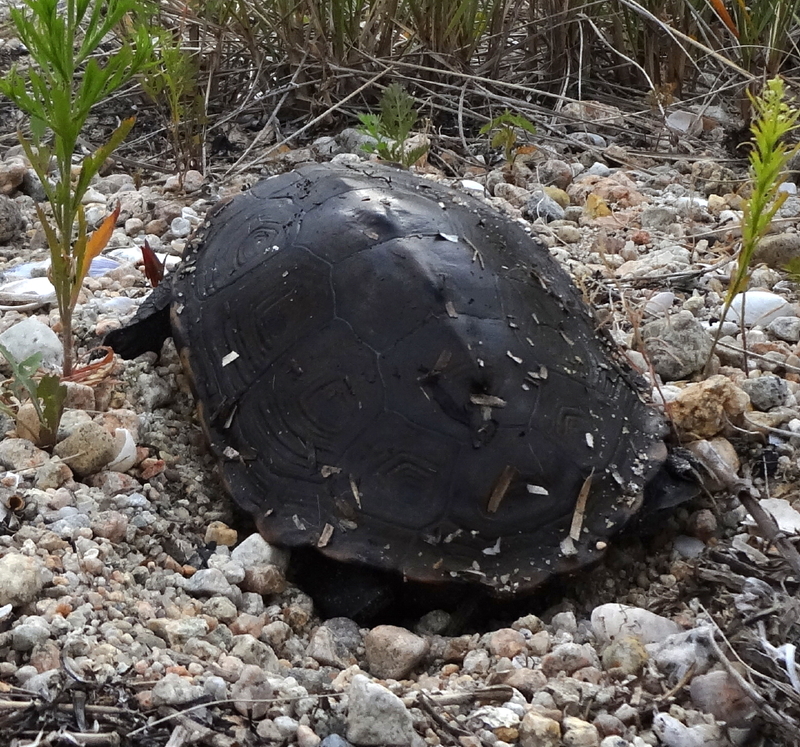 Terrapin #299 has recovered from severe trauma to both forelimbs that hinders her ability to nest. So, we watch her each season with great loving concern to ensure that her offspring get a boost toward survival. We’ve been observing #299 since July 2005 when she laid a nest of 16 eggs in an overwash area of the causeway to the barrier beach. Those vulnerable eggs were harvested and brought to Tabor Academy’s Schaefer Lab for incubation and study by Sue Wieber Nourse’s advanced marine science class in field studies, an award winning, hands-on science research program now discontinued at the school. Sue and her students released all 16 babies back in their natal nursery marsh in September 2005. This year, Terrapin #299 has been crawling around the barrier beach at Aucoot Cove since May 31st trying to deposit her first nest of the year. This morning, she finally completed her nest and Rufus the Turtle Dog saluted #299 for her outstanding work. 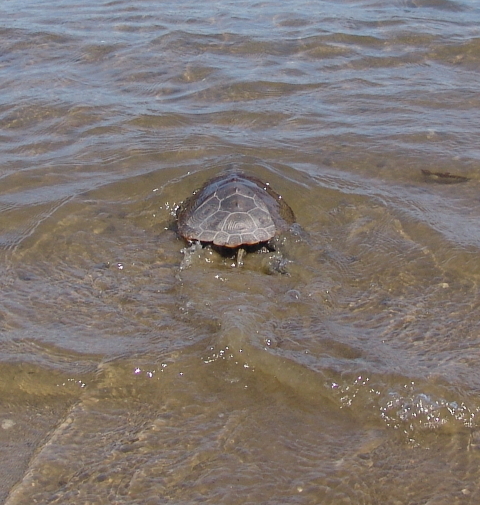 On Friday Terrapin #816 swam ashore from the Broadmarsh River in Wareham to lay her first nest of the year. Lucky for her, and her offspring, the Zollo Family has created a “Field of Dreams” for terrapins by transforming their exquisite bayside property into a turtle garden, a wildlife sanctuary for threatened diamondback terrapins. The story began back in 2007. Michael Zollo had been a student at Tabor Academy where Turtle Journal’s Sue Wieber Nourse held the Jaeger Chair for Marine Studies. 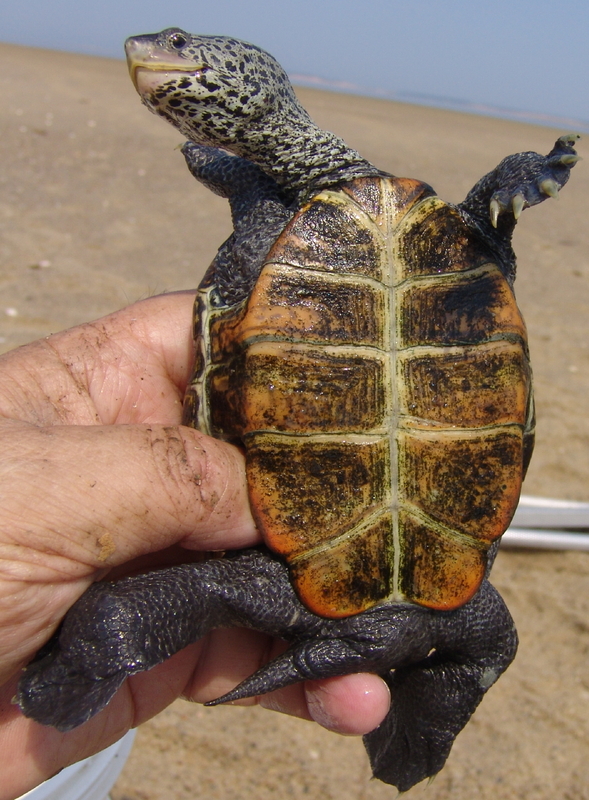 He followed closely the discovery of threatened diamondback terrapins in Buzzards Bay by Wieber Nourse’s students in her Advanced Marine Science research course. 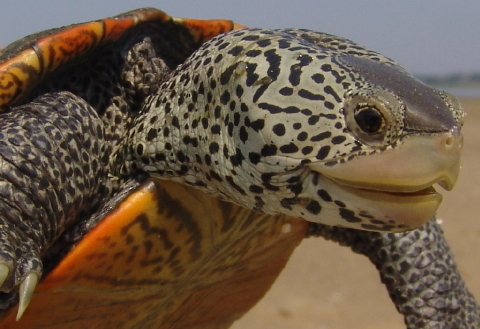 (See Students Follow Clues to Rare Turtle; Tabor Research May Help Increase Threatened Species, December 2003.) 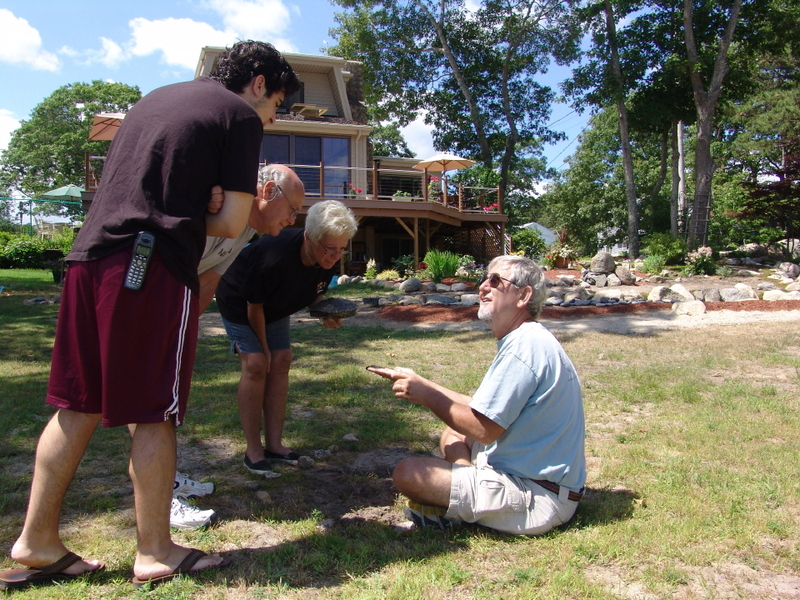 So, when a terrapin came ashore during the July 4th weekend of 2007 on the Zollo property off Broadmarsh River in Wareham, they knew what to do and whom to call: the Turtle Journal team. Michael (left), Louis (center) and Michele (right, holding turtle) observe as Don Lewis confirms the nest and protects the eggs. They learn that their property is perfect nesting habitat abutted by a pristine nursery salt marsh. And they want to know what they can do to help this rare and threatened species in their own backyard. 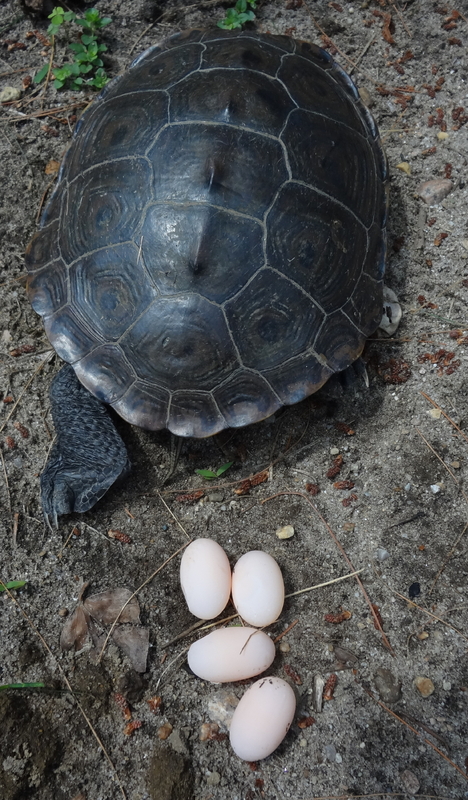 Back to the future last Friday, Michele welcomed the fourth terrapin nester of this year, #816. She had laid her nest fifty feet from the sandy turtle garden, amidst grassy roots that can invade turtle eggs and destroy hatchlings. Not surprising for Terrapin #816. As most terrapins do, she comes to the same spot every year as is confirmed by this photograph of her 2010 nest. The hope is that her babies, when they emerge, will be imprinted to the sand of the turtle garden. As she has done so faithfully for five years now, Michele followed perfect protocol in immediately harvesting the eggs and relocating them to the much more viable sand of the turtle garden. 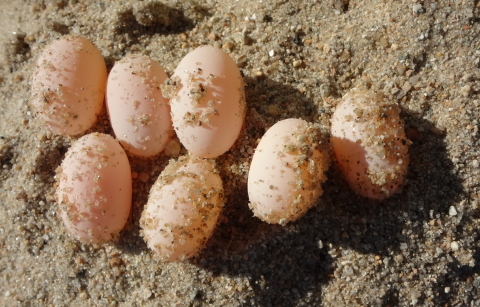 Fifteen beautiful, freshly laid eggs representing the future of diamondback terrapins in Buzzards Bay. After yielding her updated measurements to Sue Wieber Nourse and her eggs to the Zollo turtle garden, Terrapin 816 headed back into Broadmarsh River. We are all planning a “Welcome Home Party” for June 2015 when we should see the first babies from the turtle garden returning as adult mommas to create their own nests full of hope and promise for diamondback terrapins in Buzzards Bay. When they do, it will be thanks to the efforts of the Zollo Family and folks like them who take it upon themselves to build fields of dreams to conserve nature for future generations of terrapins … and people, too. 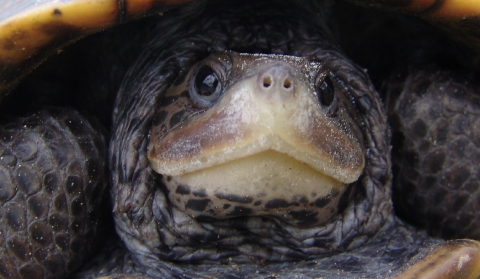 You are currently browsing the Turtle Journal blog archives for June, 2012.